Ready for a challenge? That is the one thing you have to ask yourself before you play Alien: Isolation. If you’re a fan of the venerable horror series, you already know you want to play this game. The question then becomes — do you have the nerves for it? 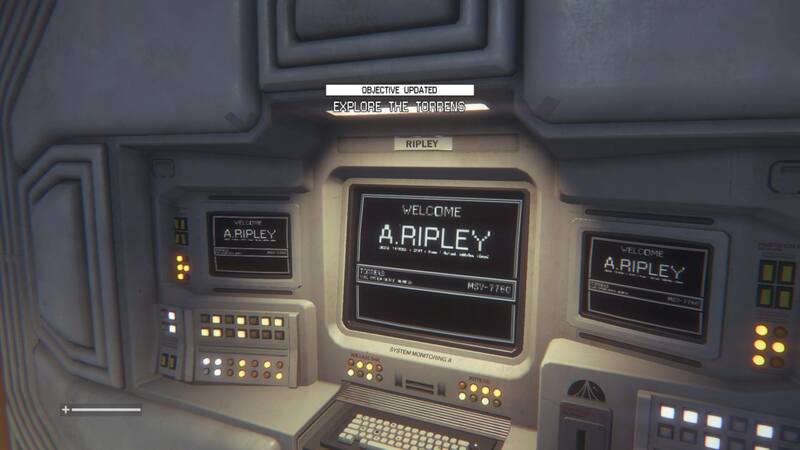 In Alien: Isolation, you play as Amanda Ripley, daughter of Ellen Ripley from the Alien movies. The game takes place 15 years after the events of the first film; while Ellen is in stasis and has not been able to relay what horrors occurred. Amanda wants answers, and she’ll do anything she can to get them. So, you get sent out to pick up the flight recorder of the Nostromo (the first film’s ship where it all went down) from space station Sevastopol with a team of two others. Things go terribly from the outset, of course, as happens in any good horror movie/game. As you walk through what is left of the space station, you come across pickups that you can use to craft items such as health kits, pipe bombs, noise makers, and more. You have to craft the items in-game, without the action pausing, so it is advisable to do this while hiding. The crafting interface is a bit clunky, but not overly so. There are also ID tags to collect, and audio tapes to play. Rest assured the completionists out there will have plenty to do, especially if you don’t play on Hard mode the first time through. Do not play this game if you don’t like punishment. You can pick the “Easy” mode of the game, but don’t expect it to help a whole lot. Between constantly monitoring your motion tracker, waiting for what feels like ages to figure out the Xenomorph’s path, and even having to hold your breath, if you forget to do any of these things you shouldn’t expect to live very long. In fact, if you have the PlayStation Camera hooked up to your PS4, any loud noise uttered by you or someone else watching you play can alert an enemy to your location. This is a pretty cool feature that adds to the immersion of Isolation. Head-tracking is also an option with the camera connected by holding L1, and is fairly accurate (though offers no enhancement compared to just using the left analog stick). I remember my first two deaths in the game memorably. The first, you may be surprised to learn, was not by the Perfect Organism, but was actually at the hands of another woman. Society has gone down the drain ever since the alien got loose, and so most people that I met along the way were hostile, usually shooting on sight of someone outside their group. My second death? Oh, you better believe it was the Xenomorph. I had already seen a glimpse of the creature, and of course my path required that I creep right under a vent opening that the alien had previously been seen jumping up into. I had unlocked an elevator just past that vent. I mustered up my courage, and ran over to the doorway. I made it to the elevator, had the prompt to press X to go to the next section, but in my haste I didn’t press X immediately. Suddenly and without warning, I was attacked from my right side, and the last thing I saw was the Xenomorph’s dual-mouthed gape as he prepared to consume me. One area that can feel a little disappointing is the graphics. The environment is well-detailed, but character models can come across a bit stiff. The frame-rate can also dip at odd times. The initial cut-scene, for instance, stutters along with a choppiness that can make you cringe. Aliasing shows up on straight objects in the distance. It seems that this may be a case of the previous generation of consoles holding things back on the current generation a little bit. Lighting, however, is impeccably done. Whether in near pitch-black or out in the open, light bounces off everything realistically, casting shadows that can actually help you avoid your enemies. Isolation looks like it was ripped straight out of the first movie, with its retro-futuristic technology. You walk up to computer terminals or wall-mounted rewiring stations, and have to wait for them to boot up. This is another great move by the developer that can add to the tension of progressing while constantly being stalked. Unfortunately, those same graphics can also cause the occasional confusing or startling glitch. Besides smaller objects clipping through one another, the Xenomorph itself is not immune to an odd glitch here or there. One immersion-breaking standout occurs with alarming frequency; when you are hiding in a locker, as the alien performs his animation to smell the area, his head pokes right on through the locker, effectively touching you right in the face. This can actually be pretty startling, but it is ultimately just funny to see. Other times, the alien will drop down from a vent, only to somehow disappear. Your motion tracker either doesn’t work for a while after this, or shows that the alien has been teleported across the level. Glitches like these definitely break through the immersion and remind you that you are playing a game. Play this game with headphones on. Play this game with a decent surround sound system. Play this game at high volume. Play this game in the dark. It will scare you regularly, and those scares will be enhanced with the proper setup. You will die, a lot. This can be frustrating for some players, but once you figure out what the alien is most likely to do, you can adjust your plan accordingly, moving ever-so-slowly towards your goal. Hearing the Xenomorph move around in the vents above you, while simultaneously hearing your motion sensor’s proximity beep get ever-quicker the closer it gets is a terrifying experience. There’s a dynamic soundtrack chock-full of high-pitched violins and creepy ambiance. In fact, the team at The Creative Assembly used some parts of the original Alien score, which can provide nostalgia for any fans of the movies.